A brilliant Cocktail named after a brilliant TV sitcom series - "Ad Fab" (Absolutely Fabulous) starring Jennifer Saunders and Joanna Lumley. 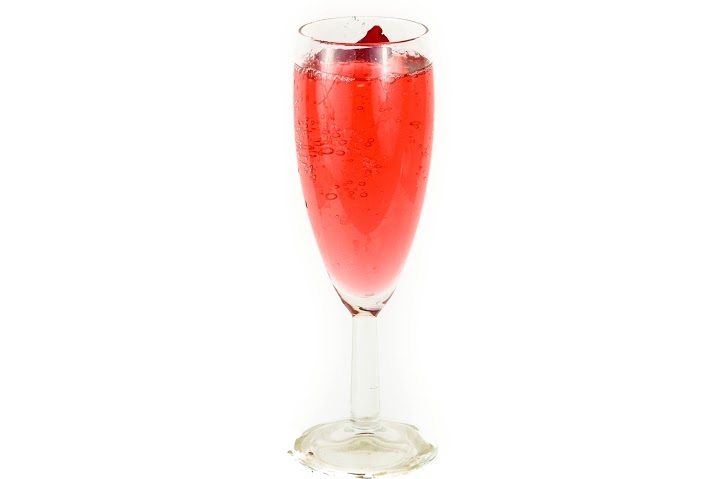 The three unassuming and uncomplicated ingredients mimic the two main characters perfectly - Vodka, Cranberry Juice and Champagne. Whether you are a Sloane Ranger or not, this is a fabulous Cocktail; simple, easy to make and certainly kicks a huge (if not decadent) punch! Add and combine the Cranberry juice and Vodka into a Cocktail Shaker over ice. Shake. Strain into a flute glass and top-up with Champagne. Garnish with a flourish a ripe, plump strawberry. In 1992, Ad Fab (Absolutely Fabulous) series 1 first burst onto British television screens. Over the next five series and 39 episodes (1992-1996), Ad Fab took hold and became an extremely popular comedy Sitcom. It is said that in 1999 at Monte's Club in Sloane Square, London, the Ad Fab (Absolutely Fabulous) Cocktail was created. Being Sloane Square (home of the "OK Yar" Sloane Rangers) Vodka, Cranberry juice and of course Champagne made this Cocktail a big hit and extremely popular. With simple, classic ingredients this Cocktail is now a staple for many parties and events. Ad Fab IS Absolutely Fabulous, OK yar?